You have to ask for water in 2018? "Thank you for being a globalist and here's your free bottle of water" seems to be a 2017 thing. In 2018, unless you specifically _ask_ for water, it's seldom offered. 9 Hyatt stays so far this year. To be fair, I always arrive _late_ at night after a full days work and/or travel. Perhaps the graveyard shift isn't fully trained. Referring to WoH terms and conditions, they do say that you must specifically ask for water. It's unclear whether you must ask _only_ at hotels which give you an empty bottle, or at all hotels. In my experience, it's All Hotels In The USA. I wonder if this is a new Hyatt trend, where you have to specifically ask for each and every benefit? If it's any consolation, Starwood is equally crappy: you have to specifically ask for your free bottle of water. Discoverists receive a complimentary bottle of water each day of their stay at participating Park Hyatt, Miraval, Grand Hyatt, Hyatt Regency, Hyatt, Andaz, Hyatt Centric, The Unbound Collection by Hyatt (excluding Oasis Homes), Hyatt Place, Hyatt House, Hyatt Zilara, or Hyatt Ziva hotels and resorts. 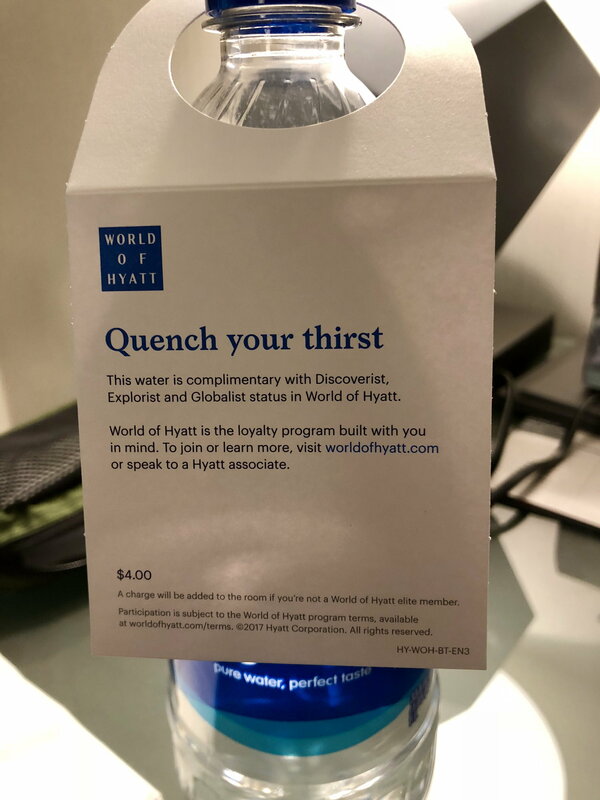 Select Hyatt hotels and resorts may (at the hotel’s or resort’s discretion) provide guests with a reusable water bottle and access to filtered water filling stations. Guests at such hotels and resorts may receive the complimentary bottled water available pursuant to this benefit by asking a front-desk Colleague at the applicable hotel or resort. This benefit is not offered at Hyatt Residence Club resorts, Oasis Homes, or M life Rewards destinations. My Globber profile states I like extra water in the room, suite, villa but not every property cares to oblige. The only time I've never had water is if I'm switched to a brand new room and the profile requests didn't carry over. PH NY has child sized bottles and kind of chintzy with them. Slow to bring them upon request. Ended up needing like 8 mini bottles if you're making coffee or trying to drink your daily needs. Andaz 5th had their interesting mini bar that was never fully stocked. At least their NY state water was a full size. Generally, quite plentiful and full sized. PHs Seoul, Busan, Tokyo, - 4 minimum and some refrigerated like I requested. GH Seoul only 2 in room. Call me nostalgic, but I still remember the Good Old Days where hotels delivered on their written promises without your having to specifically ask them to keep each individual promise. I'm still missing the Diamond welcome amenity being offered, with being asked to choose a food item and a beverage plus a delivery time at check in. I'm happy to hear Hyatt is being more environmentally responsible. By the year 2020, there wil be more plastic in the oceans than fish. I have never been to a hotel that didn't have safe drinking water available right from the tap. Starwood is equally crappy: you have to specifically ask for your free bottle of water. Another reason I love Starwood. From WoH terms and conditions. Each hotel is free to determine whether or not to provide bottled water at their discretion. You must not have been to a lot of places in Asia/Africa/etc. There are many locations where you absolutely can't assume that "safe drinking water" will come from the tap. I agree that plastic bottles are terrible for the environment, and I have participated in our local campaign to ban retailers from using plastic bags, but there most certainly are locations where I only drink bottled water. MSPeconomist, Aventine, synd and 2 others like this. I'm happy to hear Hyatt is being more environmentally responsible. By the year 2020, there wil be more plastic in the oceans than fish. How will the plastic bottle I recycle in Topeka end up in the ocean as part of some dubious statistic? A couple of decades ago, before our obsession with bottled water, it was not unusual for hotel rooms to have a separate, plumbed feed of drinking water ( as an extra line in the bathroom sink). Now that's never seen, not even in new builds. I prefer my own insulated water bottle, and would fill it for use if a clean source were provided, but now the only source is the bottled water in the room/lounge, thereby defeating the purpose from an environmental perspective. Agreed, but it still makes far more "green" sense for a hotel to offer a filtered or bottled water dispenser for guests to refill their own containers. At best these things are hidden away in the gym, rather than in the lobby or executive lounge. You mention two parts of the world where indeed you don't want to be drinking from the tap, but also can't rely on the plastic being recycled or treated in a responsible manner. It's not like those "parts of the world" don't have any hotels that deliver water in refillable glass bottles to the rooms; these hotels are just generally more upscale, boutique-y, or eco-themed. I suspect that for large chain hotels like Hyatt, you wouldn't get hotel owners onboard. A bigger problem still may be that in those "parts of the world" not a small number of travelers will be conditioned to expect bottled water as the "safe" option. Even in places with safe drinking water, there may be travelers who are not monsters and still would like to receive the water bottle the program promises -- for instance, business travelers who take the water bottle to the car to the morning when they leave the hotel. My personal experience is the opposite. Except in weird properties that have refilling stations instead of bottled water, I've mostly seen properties very proactive in providing water -- sometimes more than one per day. I mostly travel in California. GH and Hyatt Olive 8 in SEA last week said water in the rooms were free for me (despite the tags saying $5). It's so true. Traveling, and especially dealing with hotels and airlines, has made me a much more assertive person. Otherwise you just leave so much on the table... It does get old having to ask for things so often that you feel like you shouldn't have to, though. Not sure which are the 6 properties mentioned by OP, but this is what I tend to see these days ... this one is 1L bottle of Aquafina, 2 in the room with the same tag, replaced each day during our stay. At the Conrad Koh Samui, they have been using glass bottles for years. The bottles have the inevitable scuffs and scrapes from being reused so many times, but I fully support this sort of thing to reduce waste plastic in countries with marginal water systems. In the US, I always drink tap water. If I am backpacking or hiking-in to a job site, I always use canteens filled with delicious tap water.